At Shark Dive Maui, you are guaranteed to see a shark. Scuba certified divers can descend into the 750,000 gallon Open Ocean Exhibit with over 20 sharks, stingrays and thousands of tropical fish at the Maui Ocean Center. The $20-million state-of-the-art facility Maui Ocean Center, a top-rated attraction in Hawaii, is continuously luring visitors from all over the world. Who could blame them, with the experience of having a glimpse of Hawaii’s undersea world and the thrill to dive with sharks and stingrays, who would want to miss this opportunity? At Maui Ocean Center, you’ll be able to see magnificent displays of live corals. 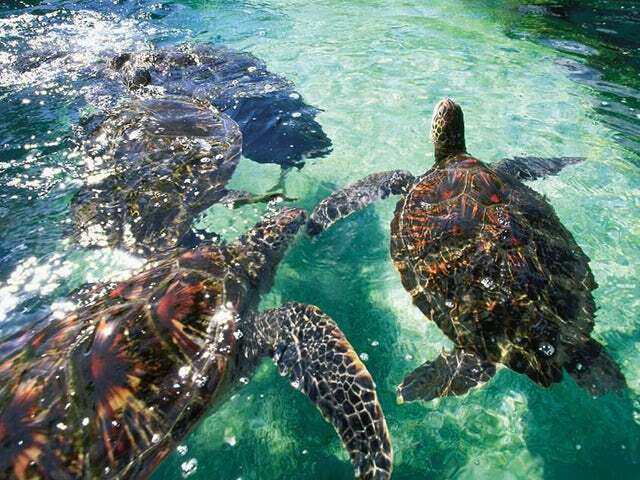 Be fascinated at green sea turtles playfully swimming. Get chills and the thrill of having close encounters with sharks, rays and a whole lot more. They also have an educational program just for the kids, while having fun at that. You can host their birthday parties here too. Maui Ocean Center is a perfect place to spend time with your family. After an exciting, fun, and thrilling day, you can then later on get souvenirs at Shop Maui Ocean Center and relax dining at the café or Seascape Ma’alaea Restaurant with spectacular views. Contact us now to experience the beauty of Maui Ocean Center.